Happy Super Bowl Sunday (A few days late). I have to fully admit that I don’t follow NFL football throughout the season. In fact, this Super Bowl football game will be the first NFL game that I watch in 2012. However, I must point out that I am a rare fashion-loving girly-girl who can appreciate a sporting event – thanks almost entirely to my childhood upbringing with parents and siblings who enjoyed athletics, specifically the game of baseball. 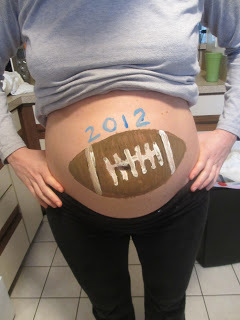 Thanks to my husband, who painted an appropriate image on my growing belly. I have always considered myself a morning person. I have never been as talented as my younger sister at sleeping in until one in the afternoon – ﻿a skill she has recently perfected as an undergraduate at James Madison University. And being a high school teacher with an alarm clock that rings at 5:00 AM, I don’t really have the choice to leave my house prior to the daylight, anyways. But with my ability to wake fresh in the mornings, as you may expect, comes my downfall: my nights. Even before my career, I have never been much of a night owl. And lately, with the new addition of Baby Brickner in my belly, I have found my bedtimes to get earlier, earlier, and earlier. Sure, I read how extreme fatigue is a sure symptom of pregnancy – but the last few weeks I have FELT it more then ever. Baby bean & I can be found at approximately 8 PM, pregnancy pillow nestled around us. And while we used to be able to at least make it through a thirty-minute DVR’d show before being completely in REM sleep mode … those times seem to have passed by now. Something tells me in July (Baby’s ETA) … my bedtimes aren’t going to get any later. The only difference: I most likely won’t be able to stay asleep for long. Baking Soda … Boy or Girl? I’m not quite sure that I expected I would feel this way, but I truly am happy with a healthy Baby Brickner – whatever the gender may be. Sure, when I was younger I certainly had visions of what my future family would look like … as my husband could attest to. In fact, during my junior year of high school, I had a specific plan to raise twin girls named “Whitney & Brittney.” (Seriously … What was I thinking?!!) Now that I am older, wiser, and the situation has gone from fantasy to reality – I can honestly say that I am already in love with the baby bean growing inside of me. Boy or girl. But that doesn’t mean that we aren’t anxious to know our fate. The suspense is really hard to handle. There have been many times (at Target, H & M, and Macy’s, specifically) … that I have wanted to buy one outfit for each gender and then take the other back once we knew the final verdict. But in the meantime, in an effort to make the days go by faster, we decided to try out some of the “gender prediction” tests out there in cyberspace. The baking soda test was our first experiment. There was certainly no fizz. So looks like TEST #1 = girl. Now just five weeks to patiently wait to find out how accurate the baking soda test really is. Oh, and by the way … my husband is having a boy. His pee definitely brought on some fizz. 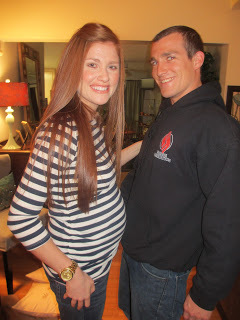 It’s been two weeks now since our pregnancy has been completely, 100% official. And by that – I mean since we revealed our big news in cyberspace. YES, on facebook. It’s funny how big of a deal it has become – and how truly, it only took one press of a button to share with so many people about the life-changing news that had been on the forefront of our minds for the past couple of months. So how did we do it? I’m almost embaraased to admit that that was a much-pondered thought for me prior to the big reveal. Do we share our personal ultrasound picture? Upload a photo of my expanding belly? Or just simply start referring to it in friend’s comments and see if anyone actually noticed. 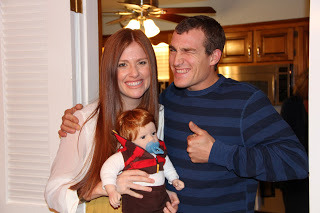 The next question … will BABY BRICKNER have the red hair … just as my niece Abbey’s doll does in the above photo. We shall see, in July that is. Even though my “baby center weekly update” informed me this morning (as it has every other recent Monday) that I am now officially 14 weeks pregnant, additionally – my belly seems to be expanding nearly daily, and I still have a certain everlasting nauseaus feeling … I still sometimes can hardly believe that I am pregnant. Even with my monthly doctor appointments (which, by the way, are quite the highlight of my days), it is those weeks in between that make me question whether I could really be that lucky to be expecting a little bundle of joy. So when, on this past Saturday morning, I felt what I truly am convinced was Baby Brickner moving about … I pretty much could have jumped on my rooftop to share my enthusiasm with the neighborhood. My sister-in-law had told me a couple of weeks ago that a “butterfly-type”﻿ motion was the first hint she had of her future kin, but I had no idea I would have that same feeling in my own tummy so soon. I thought I had perhaps felt those butterflies at about the same time last Saturday AM, but it was this time that I just knew.